How is your 2019 going? Greetings to you from our winter retreat on rocky storm tossed Pacific beaches with high snowy peaks above. We are having a great winter of climbing and skiing with some rough water boating thrown in. What about you? Please tell us what you have been up to. We are about to set out for our annual pilgrimage across Merry Old England, to Lincoln, London, and Bristol, followed by a New England journey to New York and Boston. Can you come and meet our leader and presenter Dan Mazur? Please log in to MountainTalks.org to see our schedule of slideshows about rescues on Everest, high climbs of Himalayan Peaks, treks to remote areas and giving back to mountain peoples. 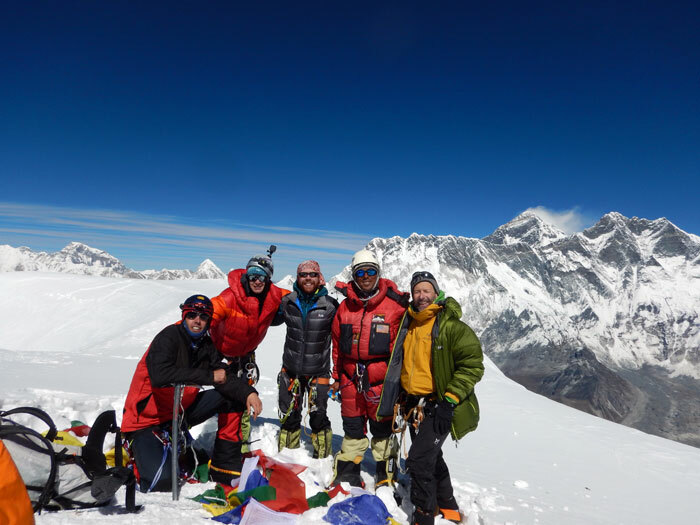 Our 2019 featured charity is CleaningUpMountEverest.org and their new waste treatment plant for Everest Base Camp. Please Join Us and Get Involved with MountEverestFoundationNews.org !! 2018 was a very successful year for our teams of men and women of all ages and abilities. 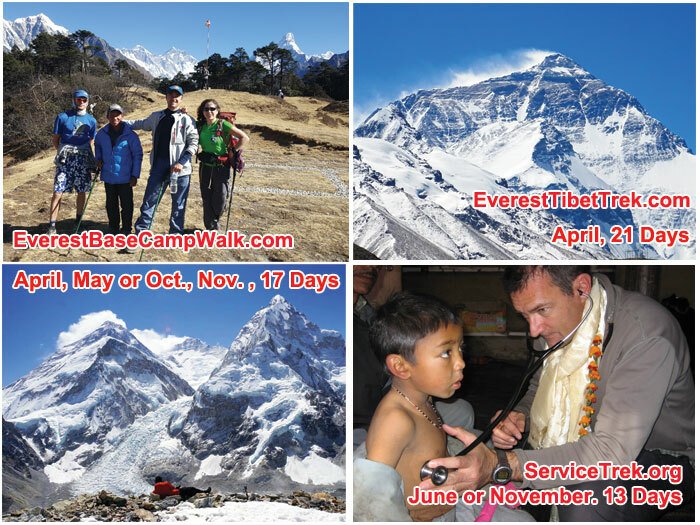 Volunteer Service Trek June and November. PEOPLE ARE ASKING US QUESTIONS. Hey SummitClimb: What progression do you suggest as I explore the mountains? Looking to go a little bit higher than just base camp? 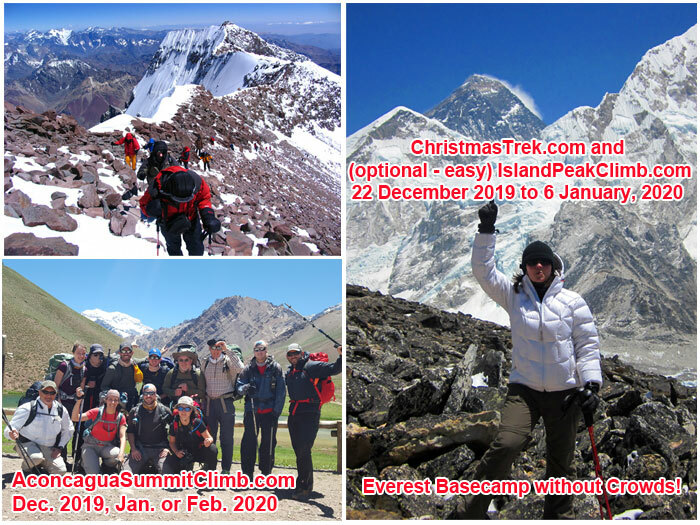 Try our short "trekking peaks": In Spring or Autumn LobuchePeakClimb.com or IslandPeakClimb.com . In Summer, PastorePeak.com and in Autumn MeraPeakClimb.com . 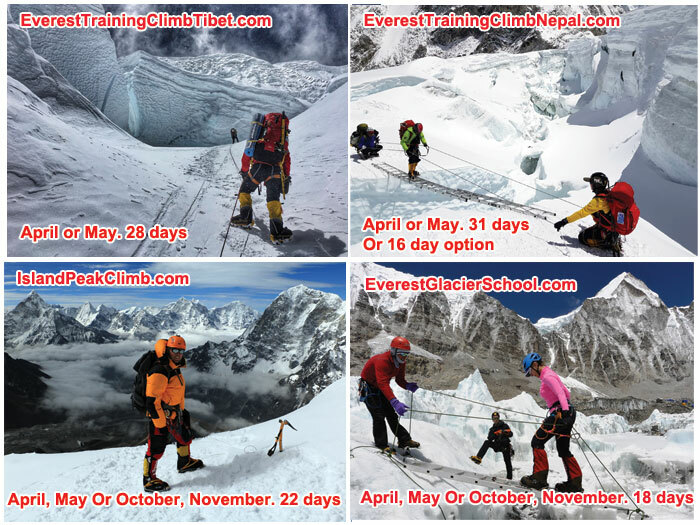 Interested to learn basic mountain climbing skills on an icy peak in a short amount of time? Go for one of our glacier schools. Such as 19,700 foot / 6000 metre high Spring or Autumn EverestGlacierSchool.com or 14,400 foot / 4350 metre high Free of Cost May, September and January www.CascadeGlacierSchool.org . Want to test yourself at high altitude for a short amount of time and less money? 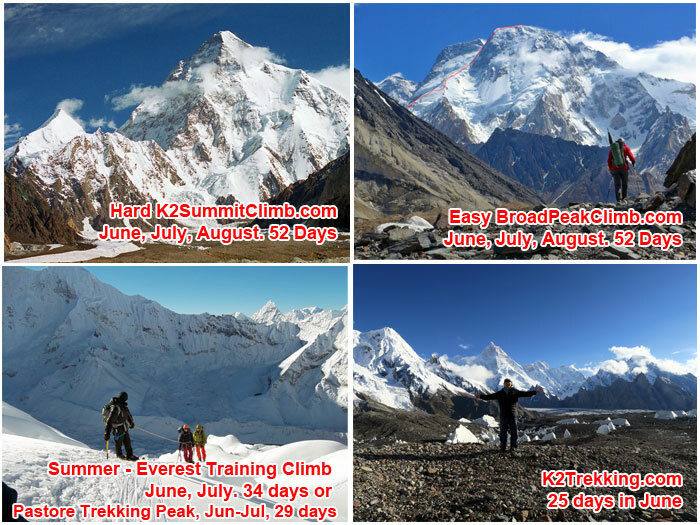 Sample our training climbs and 23,000 foot / 7000 metrehigh peaks. Spring EverestNepalTrainingClimb.com (Camp 3) or EverestTibetTrainingClimb.com (North Col) . Summer EverestK2TrainingClimb.com (Camp 3). Autumn BaruntseClimb.com , AmaDablamClimb.com , Winter AconcaguaSummitClimb.com (Famous 7 Summit). Ready for one of the world's highest fourteen 26,000 foot / 8,000 metre high peaks? Spring LhotseClimb.com , Spring or Autumn ChoOyuClimb.com , Summer BroadPeakClimb.com or K2SummitClimb.com, Autumn ManasluClimb.com . Are you ready for the top of the world? : Spring EverestNepalClimb.com and EverestTibetClimb.com , and Summer K2SummitClimb.com . Ready to "give back" and do some charitable trekking: RemoteNepalServiceTrek.org . PLEASE READ DOWN for important information about our upcoming trips. All groups are led by American leaders with Everest Sherpas excellent equipment and good food. 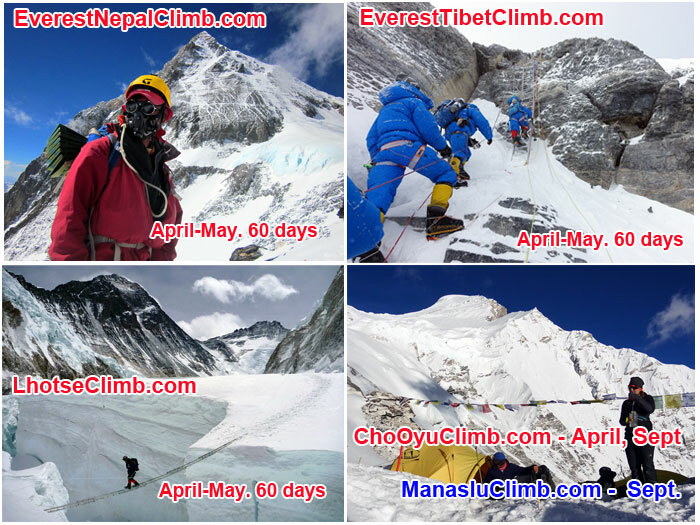 Everest Tibet Climb - April- May. 60 days in Tibet & Nepal. Full Service: $33,150, £25,950, €28,750; Basic Climb Cost: $23,450, £18,750, €20,350. Less crowded than Nepal, with better views. Leader David O'Brien. 2018 Expedition Success !! SummitClimbNews.com. Our Review Please Click Here. Success in 2017: EverestTibetNews.com . Please WATCH VIDEO ! Cho Oyu - Good Preparation for Everest . April-May. 38 days in Tibet & Nepal. Full Service Cost: $23,450, £18,350, €20,350; Basic Climb Cost: $16,150, £12,650, €14,050. Most attainable 8000m / 26,000ft peak. Leader Dan Mazur. 2018 Expedition Success !! SummitClimbNews.com. Our Review Please Click Here. Success in 2017: ChoOyuNews.com . Please WATCH VIDEO!. What Are You Doing This Summer? Team Leader Dan Mazur + Amazing Nepalese Sherpas in peaceful, beautiful, friendly Karakoram. 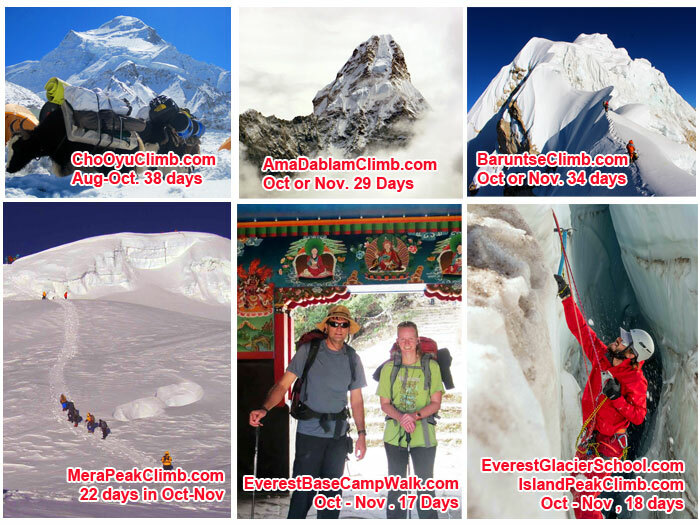 Cho Oyu - Aug-Oct. 38 days in Tibet & Nepal. Full Service: Full Service Cost: $23,450, £18,350, €20,350; Basic Climb Cost: $16,150, £12,650, €14,050. Most attainable 8000m / 26,000ft peak.